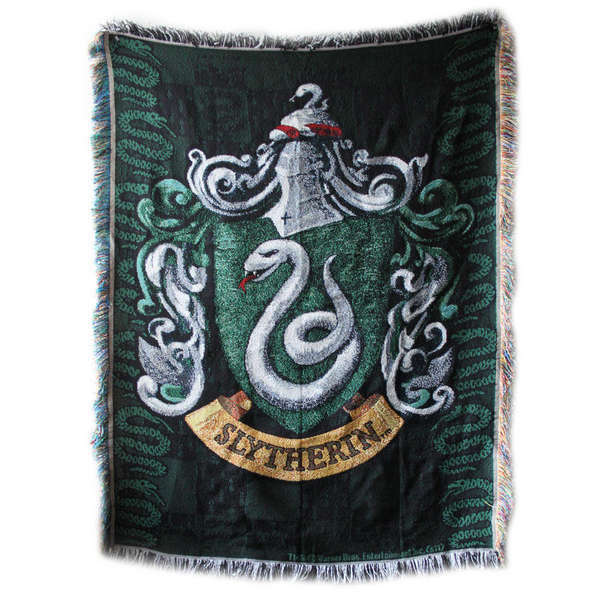 The Harry Potter Slytherin Crest Tapestry Throw is an explosion of beautifully-muted shades of green and silver, embroidered with stunning gold and red accents. Surrounding the Slytherin crest, which features a golden banner proudly proclaiming ‘SLYTHERIN’ in large block letters underneath the trademark serpent, are a cluster of smaller hissing snakes which run up lengthwise along both sides of the blanket. A soft and delicate multicolored fringe beautifully frames the entire cloth masterpiece. The throw spans 48 inches wide by 60 inches tall and is made of 100 percent polyester – which means it won’t shrink in the dryer. Medium weight and soft to the touch, the Slytherin throw is comfortable to lie on or snuggle under, especially while watching your favorite Harry Potter DVD. The giant Slytherin crest resembles those used as platform designs for Quidditch matches in the Harry Potter films, as well as the House banners falling from the ceiling of the Great Hall. In fact, due to it’s impressive décor, this item can also be hung on a wall, over a door or – in true Hogwarts fashion – from the ceiling (although it should be noted that the design only runs on one side of the fabric). No matter, though, as the blanket’s attention to tiny details in the pattern makes you want to sit back and examine even the minutest of decorations. Exclusive to the WBShop online, the Slytherin Crest Tapestry Throw is a great holiday gift and treasure for the Slytherin fan in your life. I love the coloring. That green really pops. I definitely want this throw blanket for my recliner.